I had to fly to southern Virginia for work in October so I did a quick search for marathons on runningintheusa.com to see if there were any races that I could run to help me in my quest to run a marathon in all 50 states. I was pleased to see that there was one in North Carolina where I had not run yet, and even beter it was a trail marathon. I will take a trail race over a road race any day of the week. I did a little more research on the Medoc Trail Marathon and found little information, but registered anyway. 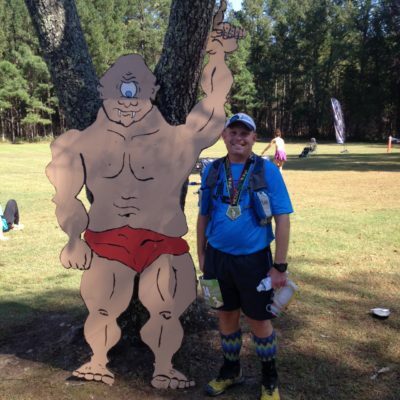 I am happy to say that I ran this race because the Medoc Trail Race series is a cool program. They offer three distances – a 5k, 10 miler and the marathon distance. The race series is very laid back and they offered some great swag. Entry for all distances included a long sleeve tech shirt and the marathon runners received a medal and special finisher swag after completing the race. The course is in Medoc Mountain State Park near Hollister North Carolina. The park is in the middle of nowhere, but was not hard to find with help from Apple Maps. The course for the marathon consisted of a short out and back on park roads, then 3 loops on trails that were mostly single track. The trail surface was mostly hard packed dirt with a couple miles of rocky tread and lots of tree roots. The elevation change for the entire course is around 1300’ of gain and loss so it was very runnable. I would say runners who have done any sort of elevation training would find that the climbs on the course to be minor, but coming from New Orleans were I moved to this summer, I took a more conservative approach and walked the climbs. My overall approach to this race was to use it as a long training run. I have a couple road marathons coming up and I didn’t want to hurt anything in this race, and really just wanted to get some quality time on trails which have been hard to come by since moving to the Big Easy. As I mentioned the course is 99% trails and the majority of the course is through the forest so it is shaded and cool October temperatures made for an enjoyable event. Aid stations were spaced every 2-3 miles apart and were well stocked with Honey Stinger gels, assorted candies and chips, and water, Gatorade, and coke. The volunteers were great and offered to fill my hand bottle and provide any help that I needed each time I came through their stations. As I mentioned this was a training run for me so I didn’t push too hard and really worked on my running form and staying steady throughout each lap. Even so I pushed a little too hard on the second loop and had to consciously back off on the third loop. I finished in 4 hours and 58 minutes for 56th out of 108 marathoners. My running kit was my usual gear; I didn’t try anything new. I carried my trusty Ultimate Direction hand bottle, and used my Ultimate Direction Jurek 2.0 vest. The vest wasn’t needed, but it allowed me to carry my phone and some Honey Stinger Chews and the keys to my rental car. My attire consisted of Nike Pro compression shorts, with Nike Dri fit running shorts over the top. My shirt was a Nike Dri fit shirt from the Rocket City marathon that I like to run in because it is very light. I used JLab Epic2 Bluetooth headphones for my music. I used Injinji running socks and did not suffer any blisters or toe nail damage. Injinjis are the bomb. I used a pair of Altra Lone Peak 2’s for footwear. They are older shoes, but they don’t have much in the way of miles on them so I am trying wear them out. The trail is non-technical and I easily could have gotten away with a less aggressive shoe like the Altra Olympus. I followed my standard nutrition plan. I used CarboPro in my handle bottle and refilled every loop. I ate one package of Honey Stinger chews and took one Honey Stinger gel and a few M&M’s throughout the race from the aide stations. I was a little off on my electrolytes because I cramped up in my right groin around mile 23. I was mixing Gatorade and water in my hand bottle at the aid stations, but I must have sweated more than I anticipated in the 60 degree weather. The cramps made me wish I had brought SCaps! which I normally have with me, but had forgotten. I won’t make that mistake again, hopefully. Overall I feel like my gear and nutrition is dialed in. My parting thoughts are on the swag – because that’s why we run these races – RIGHT! The race has cool swag. The shirt is pretty cool, but the medal is awesome. It is heavy and large. 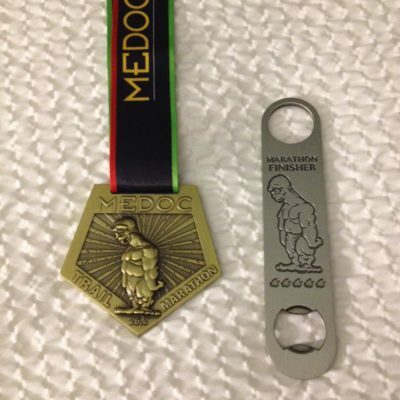 Also the surprise marathon finisher swag is a cool bottle opener with a picture of the race’s mascot The Medoc and it says marathon finisher. Overall, this was a very cool race. The course is runnable and kept me interested even though it was three loops. The race directors have lots of energy and the race itself has a relaxed vibe. It was neat to share the trail with folks doing all three distances and did not feel crowded. I highly recommend this race to anyone looking for a fun race in a cool state park.